Well, it is just like Mr. Van Dyke said. It may be the first day of spring today, but it’s -9C and windy and you can’t see a speck of grass for the large amounts of snow everywhere. Sigh. But, we are not going to let it get us down. Spring will come soon enough…right? For today, we’ve brought Spring into our lunchbox with our Spring Chicken Edition of What’s In YOUR Bento? To get started, I will show you how to make very simple, beginner style onigiri. Onigiri is Japanese for “rice ball”, a common food in Japan made of rice, and often with a small token of food pressed into the back such as a plum or a piece of fish, and/or wrapped in a piece of nori seaweed. 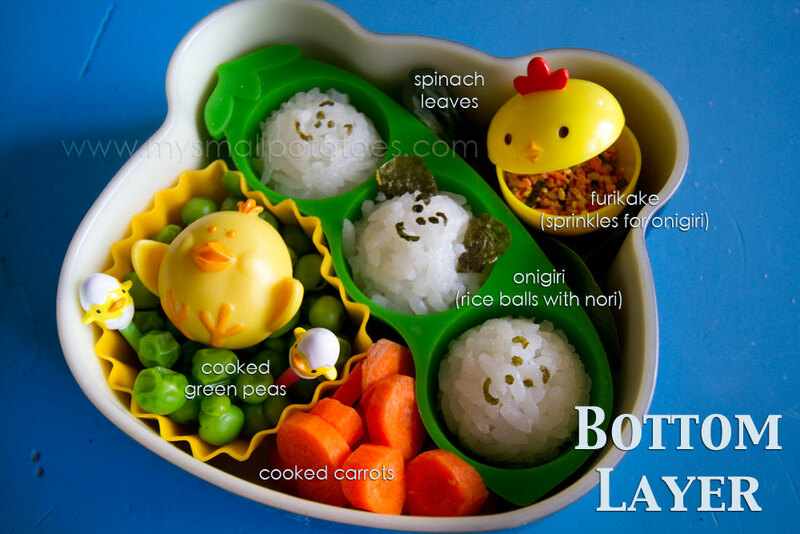 It does not have to have a piece of food tucked in it, nor does it have to have nori around it. My littlest boy likes his plain and then sprinkled with furikake, a dry condiment typically consisting of sesame seeds, chopped seaweed, and dried and ground fish. Onigiri is an indispensable part of the bento maker’s repertoire! 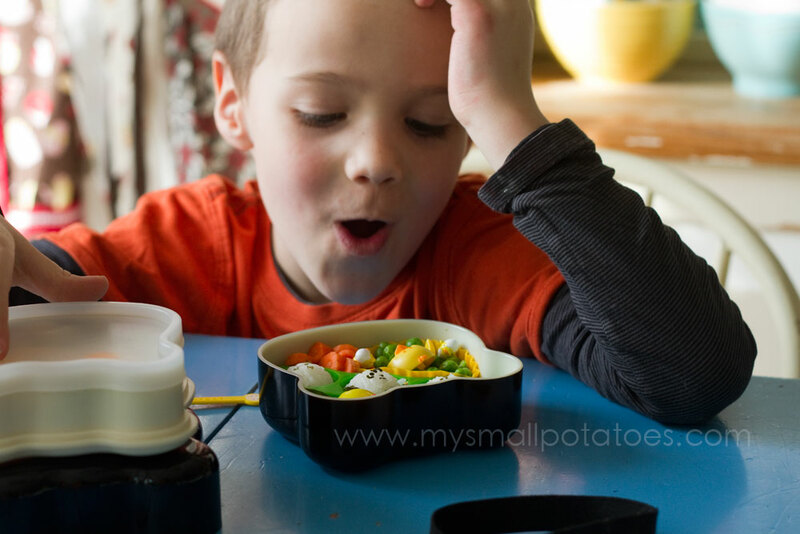 My dad is Japanese, so my kids have grown up with Japanese food and they are accustomed to the different flavours. If your child is new to Japanese cuisine, try making your onigiri plain, with a bit of salt on your hands, giving them a little bit of a familiar flavour. 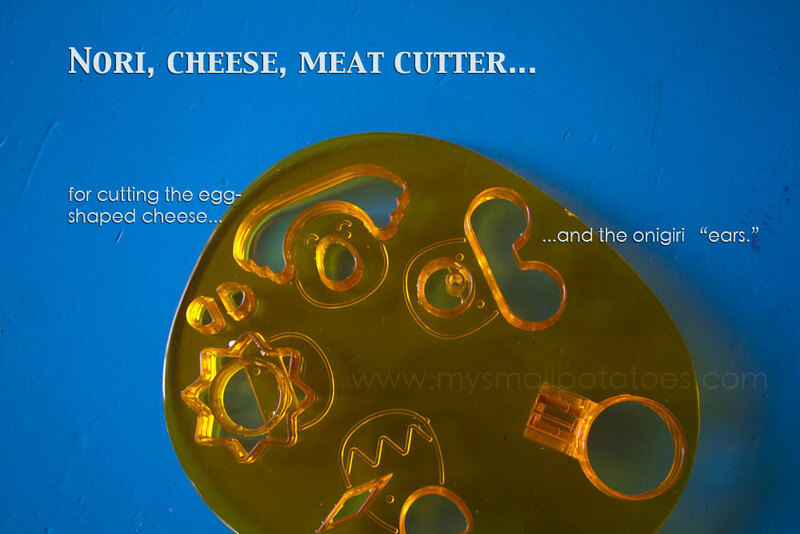 A simple method for beginners using a mold or a cup. 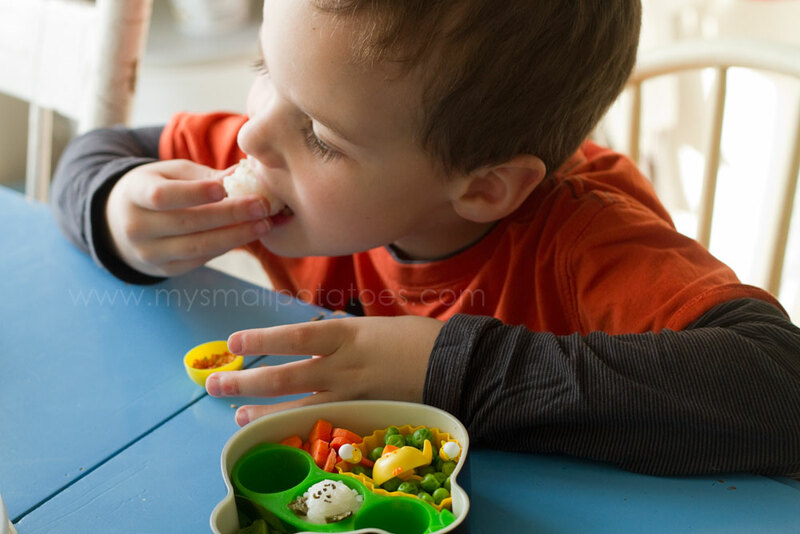 My boy likes his onigiri bite-sized, so he can dip them in furikake and pop them in his mouth, so I use a little round measuring spoon… *Your rice needs to be steamed, sticky rice, or the onigiri will just be a pile of loose grains. It needs “sticking power”! I use Kokuho Rose Rice in my rice cooker. 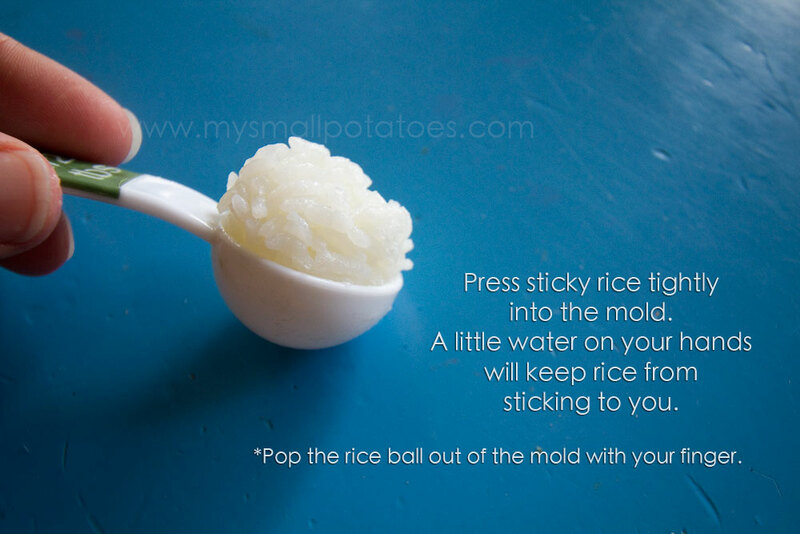 You can use any sized mold for making onigiri. 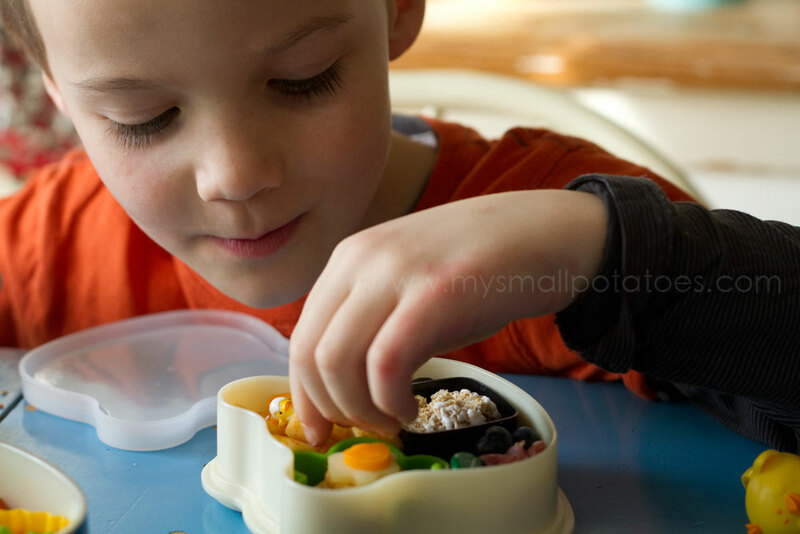 Once you’ve popped it out of the mold, press it or roll it gently between your palms, shaping it just the way you want it, and place it into your bento box. It’s that simple. And now for today’s bento… The key to giving a bento it’s best chance of staying pretty on its way to the school lunch table, is packing it as tightly with food as you can. Try to fill every empty space, just as if you were packing a breakable tea set you wanted to send in the mail. The onigiri fit so nicely in the little pea pod silicon cup, don’t they? 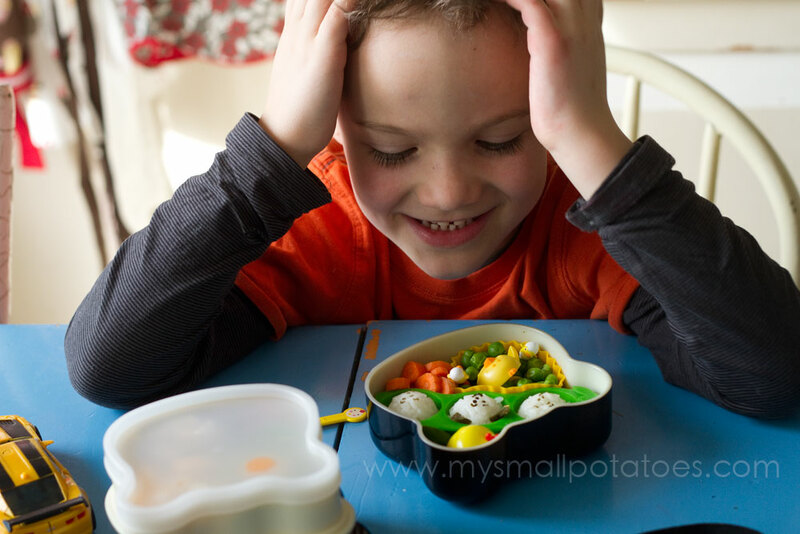 My son removes the pea pod and furikake from the bento before he puts the rest of the box in the microwave to warm his peas and carrots..and by “removes”, I mean “eats first”! 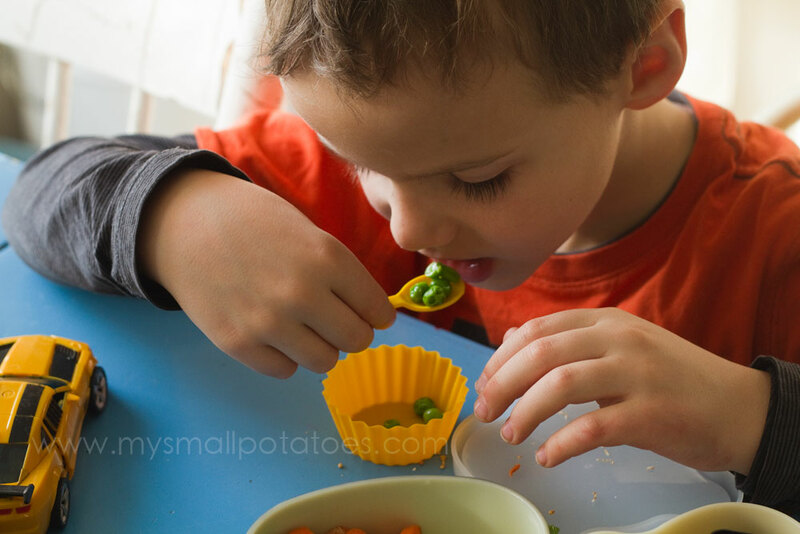 *The little chicken cup of furikake, the baby chick food picks, the pea pod silicon cup, the bigger chick decoration, and the yellow silicon cup were all purchased online at http://www.bentousa.com. 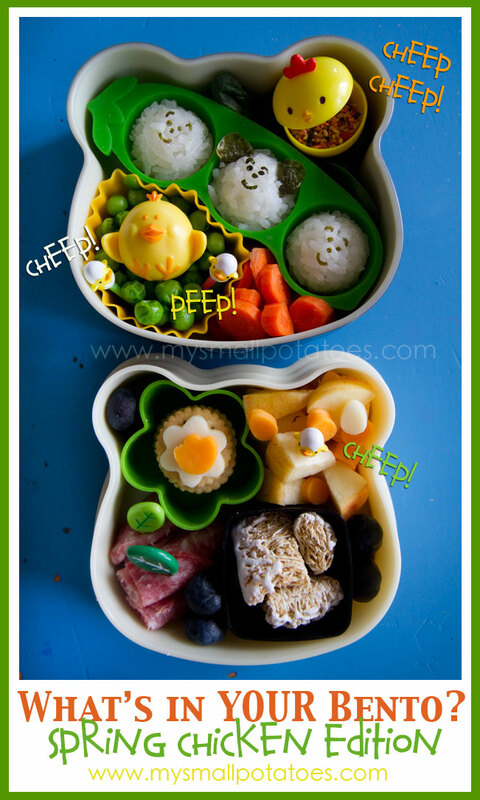 The onigiri were decorated using 2 different tools, but they come in the same set… *I used the “egg-shaped” nose of one of the critters on that cutter to make the little cheeses with the apples in the top layer of this bento. 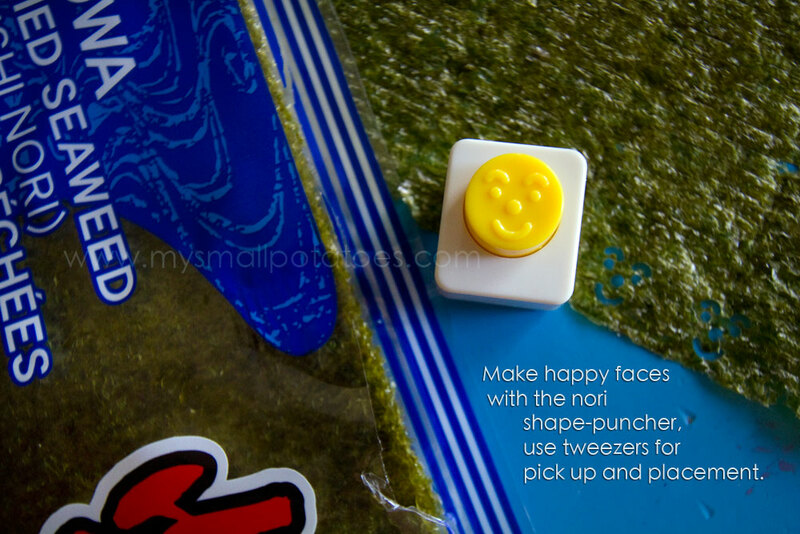 I will admit, the little faces from the nori puncher are VERY difficult to place. It’s finicky work and I have not yet perfected the finicky work part of bento-making. While I was creating these little onigiri, I was thinking to myself that my son was NOT going to get very many of these little faces on his onigiri in his life time…it was just too time-consuming! Happy onigiri-making, and may your first day of spring be warmer than ours is! 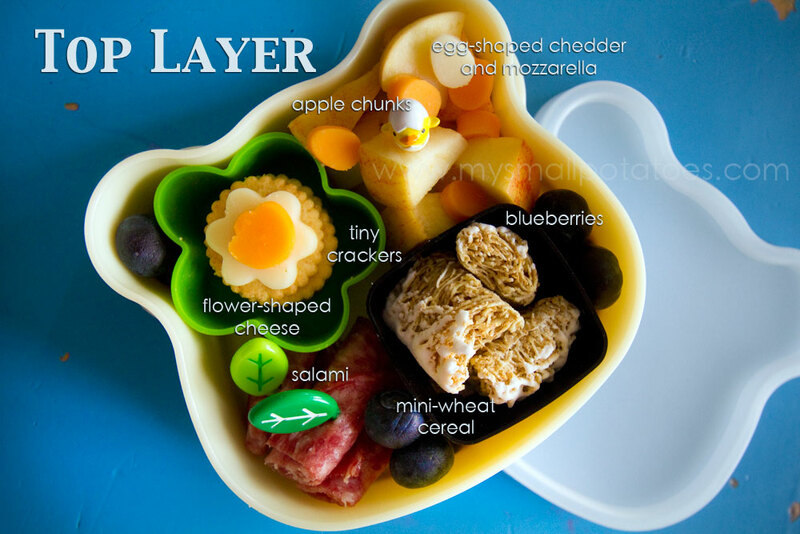 Posted in Bento Boxes, Cooking, DIY, Early Childhood, Fussy eaters, Japan, Lunch, Meals, Nutrition, Tutorial, Uncategorized, What's In YOUR Bento? Where can I buy all the containers that you use for these? Each item I used in this post has a link to where to purchase it…the links are bright orange…you can’t miss them. Where it says “yellow silicon cup” you’ll see that those words are orange. 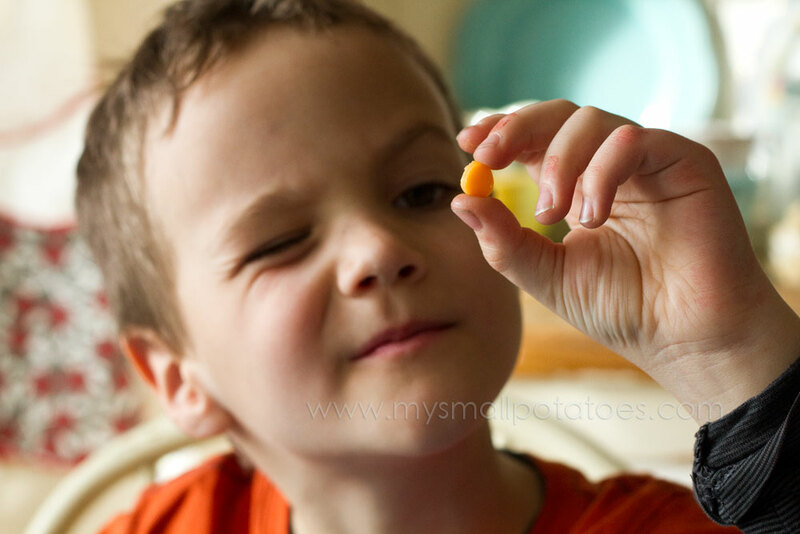 When you click on the orange words, it will open a new window and take you right to the place you can order the item. Have fun! This ist so cute what you do for your kids! It just looks awesome and it must’ve tasted as good as it looks! It’s unbelievable what you made! That must have been a lot of work. Such a beautiful lunch! I love bento boxes 🙂 maybe I can start making cute lunches for my husband. So adorable, I wonder if my kiddos would enjoy seeing these cute surprises???? ?